Baptistery (Gr. , originally, a bathing place or swimming bath; later, and in ecclesiastical usage, a place set apart for performing the rite of baptism. 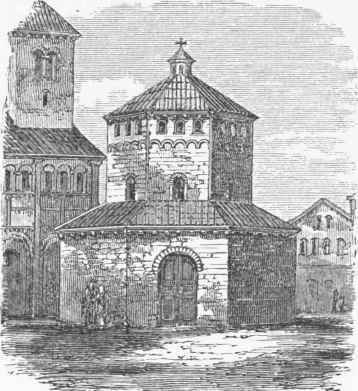 At first the baptistery was an exedra or structure outside of the proper church; later the porch, and still later a part of the consecrated edifice, was so employed. As separate edifices, several baptisteries, notably those at Rome, Florence, and Pisa, are fine structures. The baptistery at No-vara is one of the most curious buildings of this class, being largely composed of the remains of an ancient Roman temple, with an antique urn for a baptismal font. The introduction of the baptistery as a part of a church edifice dates from the 6th century. Ancient baptisteries were sometimes styled either because baptism was considered as a or illumination, or because they were places where the catechumens were enlightened in the first principles of the Christian faith. Occasionally also wo find bath, and piscina, fish pond, used as synonymes for baptistery. Baptistery is now commonly used to designate the baptismal font in Catholic and Episcopal churches, and the tank in which the rite of immersion is performed in Baptist churches, Where convenient access cannot be had to a natural body of water. A baptistery in the latter sense may be either within or without the church edifice to which it pertains.